Nearly four and a half years after Pluto was demoted from planet to dwarf planet, astronomers are still trying to figure out how big it is. The title of Largest Dwarf Planet in the Solar System hangs in the balance! Six years ago professor of planetary astronomy Michael E. Brown saw an object in the sky that he was positive was larger than Pluto, the then ninth planet in our solar system. With Pluto's status as an actual planet being hotly debated at the time, Brown's discovery of this new, larger object was the nail in the planet Pluto's coffin. Pluto was reclassified a dwarf planet, the same as several objects located in the Kuiper Belt, a band of frozen debris that circles the sun out past the orbit of Neptune. So was Brown's tiny shining object. He named it Eris, after the Greek goddess of discord. All hail Eris! All hail Discordia! Sorry, had to get that out of the way. Eris, as it turns out, is living up to its name. It turns out Eris might not be as large as Brown first expected. In November a group of astronomers witnessed Eris passing in front of a dim, distant star. By measuring how long the star disappeared behind Eris they were able to calculate the size of the dwarf planet. The results are still being published, but Drs. Alain Maury and Bruno Sicardy, both of which witnessed the event, say that the largest possible Eris is still smaller than the smallest possible Pluto. Would Doc Brown been so keen to kill off Pluto had he known Eris was smaller? "Maybe," Dr. Brown said, although as he tells in his unapologetically titled book "How I Killed Pluto and Why It Had It Coming," he thinks the International Astronomical Union got it right. 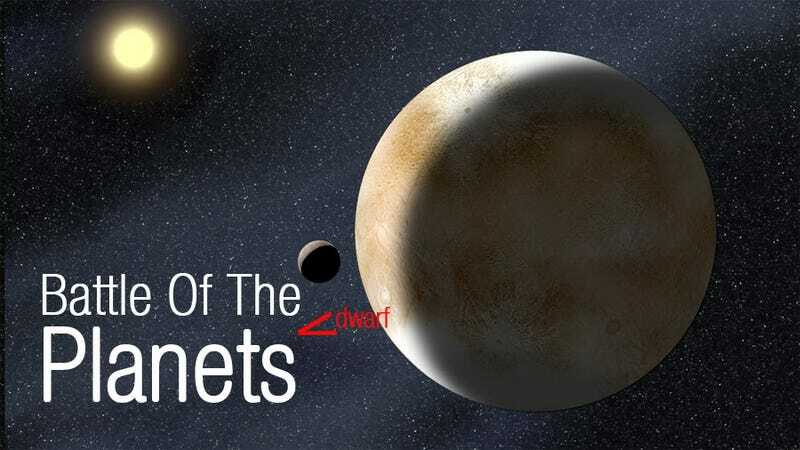 Everything is still up in the air (pardon the pun) regarding the two dwarf planets, mainly because we have no real way of knowing how large they truly are. Initials estimates by Brown had Eris at 2,400 kilometers in diameter. Later, bouncing infrared light off of Eris had her measuring up at 3,000 kilometers. The latest measurements suggest a diameter somewhere around 2,360 kilometers. Pluto itself has been shrinking for years. We initially believed it to be the same size of the Earth. It's been steadily shrinking since then, much to the amusement of scientists. In 1980, Alexander J. Dessler, now at Texas A&M University, and Christopher T. Russell of the University of California, Los Angeles, published a graph of the mass estimates through the years and jokingly predicted that Pluto would disappear entirely in 1984. "Those of you interested in observing Pluto should hurry," they wrote. Why the different sizes? Well it's quite far away. You try measuring it. Can you? No? There you go. Various methods have been attempted with obviously varied results. Some suggest the atmosphere of Pluto bends light, which would make it even more difficult to measure correctly. Still, the range of possible Pluto sizes seems to overlap the possible Eris sizes. "If you looked at the two of them right next to each other sitting in space, they would look to be exactly the same size," Dr. Brown said. "You couldn't tell by eye until you took out your really, really big ruler." What kind of scientist in his right mind thinks such a ruler exists? I'm going with the other guys on this one. Pluto is definitely bigger. We'll know for certain how large Pluto is once NASA's New Horizons craft passes by in 2015. That leaves astronomers four years to get all of this arguing out of their systems.